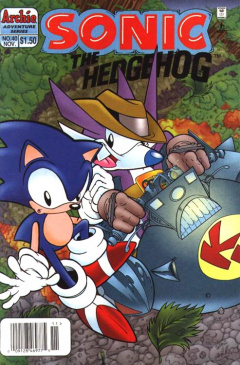 Sonic the Hedgehog 40 is the fortieth issue of the Sonic the Hedgehog comic. This comic features one story: "Court-Martial". Continued from Sonic & Knuckles: Mecha Madness. Sonic recalls recent events that have led up to the present, from his idea to be roboticized, to his capture by Nack the Weasel to his subsequent roboticization to Mecha Sonic. As Mecha Sonic, he had to fight against Bunnie Rabbot and Knuckles, the latter of whom helped stop Sonic by turning into Mecha Knuckles. Unfortunately for Sonic, the Freedom Fighters don't believe his story, thinking he disobeyed council orders to not get roboticized. His supposed act of treason has now placed him in the Knothole jail. As the new Commander in Knothole, Antoine stands guard at Sonic's jail cell, ordering him to remain silent after he goes over his tirade. He doesn't take kindly to his treatment, lounging at Antoine through the cell, but can't reach him, threatening to take him down when the trial is over. Antoine stands his guard, stating that can add assault to the charge brought against him. Sonic changes his stance from violence to words, calling out that Antoine is now only a Commander because everybody important has been put to the task of rebuilding Knothole. Antoine, however, doesn't care about Sonic's thoughts, only looking forward to the parade in his honor that he is preparing. He leaves the jail house to contact his caterer. Stuck in jail, Sonic scurries around in a panic, worried that Robotnik could attack at anytime while they are weak, and he can do nothing about it. He hears a voice outside, so he stops; the voice calling out that Sonic is not a villain. He looks out his cell's window and sees Amy Rose, protesting against Sonic's imprisonment with a sign that says 'Free Sonic!' and using a megaphone to rally her cause. Aside, Sally Acorn and a tired Rotor witness Amy's protest. They only watch, while Rotor asks if Sonic will be acquitted. Sally, as part of the council, refuses to discuss it, changing the subject to the reconstruction efforts. He acknowledges that rebuilding efforts are going well, by using King Acorn's disaster plan, which resulted in the village placing back-up units for most heavy equipment underground near the jail. Recalling the King's efforts, Rotor comforts Sally by telling her she's doing well in his place. She still remains upset, mentioning it's not easy being in her position, especially with the law making her court martial Sonic. Despite her difficult position, she gets a grip of herself and walks over to Amy to halt her protest for the day. Amy Rose takes her arrival in light, asking if she's going to pardon Sonic. Sally tries to explain that she can't, as he's being tried under serious charges. Amy starts crying, while Sonic calls out to Sally about her power trip. Sally looks up to Sonic and tells him to take some responsibility, especially since Amy sees him as an idol. Sonic calls out again, trying to reach out to Sally and explain that he doesn't belong in jail. Sally keeps her royal position in check, explaining that nobody is above the law. He yells out that the system stinks, while Sally drags Amy away, telling him to prepare for his trial in the morning. The next morning, Sonic is brought before the court, led by the judges, two kangaroos named Hip & Hop, while Antoine acts as prosecutor. The two kangaroos announce that there will be no special treatment, that they will not be the ones announcing his sentencing, and that if he is found guilty, he will be banished from Knothole. Sonic gets angered by this, asking who will be deciding his fate. The kangaroos bang their gavels, as Sally walks in, with her royal scepter and gown, announcing she will be the decider of his fate. She orders Bunnie Rabbot to keep guard of Sonic, brandishing a circular saw from her robotic arm. As Sally prepares to take her throne, Sonic turns to Bunnie and calls her out for going against him even though he saved her from roboticization. She retorts back, saying that it is old news, showing off her new 'hedgehog hunter' saw that Rotor equipped her with. The saw can seek out the personal aura left from the one billionth ring to take him down. Rotor apologizes to Sonic, from the audience, saying it was only his job. Sonic scoffs, feeling betrayed by his friends. The trial begins, as tells the prosecution to begin their case. Antoine stands up, announcing that Sonic had wilfully disobeyed a royal order to not be roboticized, only to do so for his own good. He calls up his first witness, Rotor, pressuring him to tell the court that he had personally asked to investigate Sonic before he was roboticized. Rotor says yes, but before he can say anything else, Antoine calls up the next witness. Getting further enraged and into the case, he yells at Tails, asking him if he did receive a red alert signal because of Mecha Sonic's attack. Tails also says yes, but before he can say anything else as well, he calls up Bunnie as his next witness. Infuriated, he yells at Bunnie, asking her if, had it not been for her and Knuckles, that many lives would've been lost due to Mecha Sonic. Like the others, she confirms and tries to get her say in, but is stopped by Antoine as he calls up his last witness: Amy Rose. As she sits down, he pushes a badger near Amy, demanding to know if she charged five dollars for it to join her Sonic fan club. She cries at the treatment she's receiving, forcing Sally to order Antoine to stop badgering her. Lastly, he calls himself to the stand, glorifying over his personal stance, baring witness to everything Sonic had done. With Antoine finished, Sally asks Sonic for his rebuttal. Sonic orders Antoine to remain seated in the witness' chair, as he has his own questions to ask him. He brings out a display of the jail, mentioning that, although Antoine was assigned as jail guard, he failed to notice that the cell beside his was empty. He then brings out a wanted poster of Nack the Weasel, noting that Nack should've been in there, but Antoine had not noticed anything, as he was too busy preparing for his own celebration. Antoine panics, as Sally asks him if the statement was true. He throws himself at the mercy of the court, while Sonic asks to have his cuffs removed, now that he has proven his innocence. Sally keeps the court stable, announcing that, despite Antoine's actions, the trial is about him. She asks the court for their verdict. The kangaroos announce their verdict...guilty. Sonic freaks out, while Bunnie tries to keep him calm. Sonic tells her to back off, ripping off the handcuffs with his super speed. Sally runs in between the two, announcing that the verdict is final, but Sonic demands to prove that he is innocent. Reminding her that he is a loyal Freedom Fighter, and although brash, he wants the time to prove his innocence. She reluctantly agrees, giving him twenty-four hours to do so. She maintains that, if he can't prove his innocence after twenty-four hours, sentencing will proceed. She goes over to Rotor, asking him for a wrist tracking device. He puts it on, so that he can be tracked, running off quickly, intent on proving his loyalty. In Robotropolis, an Orbinaut reports to Robotnik, informing him that Sonic has been seen on the edge of the Badland Mountains. Robotnik activates a monitor display, amazed that he is back to life and normal again. He tries to change the camera view, but due to the nuclear detonation, his super computers were knocked off-line. He yells out, angry that Sally roboticized Knuckles to defeat his perfect creation, but he intends on paying back for what she did. He has had his SWATbots working around the clock, constructing a new nuclear power plant. That is only the beginning of his plan, as he has something much larger planned under his sleeve: a weapon of mass power and destruction. He heads over to a workstation and takes out a map of Mobius. Without his computers, he uses the information he has and does some calculations to determine Sonic's location by himself. He works it out, but is pleased to find that the location he's going will likely result in his demise. Sonic has arrived at the Robo Hobo Jungle, a beat-up place where Robotnik dumps his old and obsolete bots. He steps into the dump, but is instantly whacked in the face by Caterkiller, the very first bot he encountered. Despite the threats from the old foe, Sonic enters a spindash and cuts the Caterkiller into many pieces. Not long after taking care of it, Batbrain swoops down and hits Sonic in the head. He falls down, landing in front of Motobug. Having another opportunity to beat Sonic, it swipes its claws at him, but misses, as he moves out of the way with his super speed. It gets its claws stuck in the ground, so Sonic gives Motobug a great punt, knocking him high into the sky. Despite his speed, Sonic can't stop an onslaught of Badniks, as Splats, Buzzbomber, Burrobot, Crabmeat and another Caterkiller team up on him. Angry at wanting answers, Sonic takes out every single one of them. He picks up the head of Caterkiller, asking it about Nack the Weasel. It is aware of him, but won't speak, as he is afraid of what he could do to it. Sonic asks if it would be as painful as being dragged along the ground at super speed. He runs off fast, counting down, making Caterkiller give in. It tells Sonic that Nack hangs out at the Bottom of the Barrel Bar 'N Grill, the seediest place on Mobius. He runs up to the door, but is blocked by a large gorilla. Sonic demands that he move aside so he can talk to Nack, but the gorilla tells him that he isn't seeing anybody until Tuesday. He grabs Sonic by the throat and throws him aside, farther than he's ever been thrown. Now really annoyed, Sonic charges up his Super Peel-Out and dashes toward the door, intent on getting business done, with the day almost done. The charge works, as he is able to push the gorilla back, right into the bar, shocking all the patrons. Now in the bar, he tells everybody to leave, except for Nack, whom he orders to go up against the wall. Nack, however, is using sticks for his arms, bringing out a gas gun with his real arms. He gasses Sonic, just like he did before, leaving him alone with the gorilla. Not wanting to stay, he opens a doorway leading to his hover sled. He speeds off from the damaged bar on his sled, contacting Robotnik on the journey. Robotnik answers the call, as Nack offers another deal: two million for the location of Sonic. Robotnik accepts the deal, telling him to come to Robotropolis. Not wanting to get double-crossed again, Nack does not accept that offer, instead, telling him to transfer the money to his bank account. Robotnik is also suspicious, asking Nack why he doesn't have Sonic with him. Having been defeated twice by stowing Sonic in his vehicle, he didn't want to risk it again. Unknown to him, Sonic is actually stowed in the back. He pops up secretly, and punches Nack, interrupting the transmission. Sonic takes over the transmission, knocking out Nack, and asking Robotnik if his rebuilding efforts are properly being covered by insurance, as some random person could send a hover jet into the city on self-destruct. He does so, sending the jet on auto-pilot, on self-destruct, right toward Robotropolis. Robotnik, angry at the hedgehog, smashes the communication controller he's using. Suddenly, the computers in Robotropolis come online...just as the jet hits the city, causing a massive explosion. All the way in Knothole Village, the whole village shakes from the explosion in Robotropolis. Sally runs into Rotor's lab, where Rotor receives the incoming telemetry of the explosion. Sally is curious how another explosion could occur, but is also more concerned about where Sonic is, as the sun has risen. Just as Sally mentions this, Sonic walks in, throwing the destroyed transmitter at Rotor, which he used as a gas mask when Nack attacked him. He also throws in Nack, and drops him on the floor, announcing him as the one who turned him over to Robotnik. Nack confesses to everything in front of Sally. Rotor takes Nack to the jailhouse while Sally apologizes to Sonic for everything that has occurred during the past few days. She offers to provide a public announcement and pardon, but Sonic tells her that it is not needed, as he is just glad to be back on the team. Sally, as well, is just happy to have him back. They walk outside, only to witness Antoine preparing an orchestra for after his acceptance speech and his parade. Amy Rose returns, last shown in issue 25. The book Antoine has to prepare for his catering is "The Perfect Party - By Martha Shrewart", a parody of Martha Stewart. While protesting, Amy yells out 'Shawshank! Shawshank!'. This references the Stephen King novel Rita Hayworth and Shawshank Redemption. The main character of the novel, Andy, although imprisoned in Shawshank, is actually innocent of his crimes, similar to Sonic's case. Hip & Hop refer to their court as the 'kangaroo court'. A kangaroo court is a legal proceeding that is typically a sham or one that ignores due process. After Sonic runs out of the courtroom to prove his innocence, Sally tells Sonic 'Good luck', while Tails responds 'So say we all'. This is a concluding phrase from Battlestar Galactica. This issue starts using fan letters taken from the Internet, along with those from the mail.